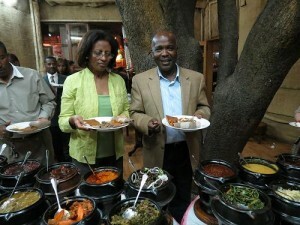 April 18, 2012, Addis Ababa, Ethiopia–Last night I sampled intestine. And it pretty much tasted like you might expect. Loved the rest of the dinner though – Ethiopian spices and textures in food are delicious! The reason I share this is that I was out for dinner with our Ethiopian partners after a great first day at our two-day Ethiopian Partners Forum. The intention of the forum is to bring staff working on CFTC projects together to share organizational objectives, challenges and ways we can strengthen our work as we continue to strive to deliver impact in our work to alleviate the impact of poverty on children. It is also about building relationships and building trust. 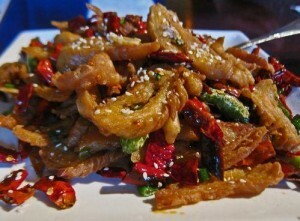 Tasting intestine? That was about trust. 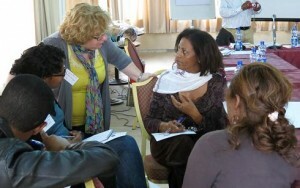 CFTC's Program Manager for Ethiopia, Francoise Briet (standing, left) chats with some of CFTC's Ethiopian partners. Each of our partners has a different approach and mandate, but all are committed to improving the lives of children – be they orphans and vulnerable children, children impacted by HIV/AIDS, child labourers, or children living in extreme poverty. I was so impressed with the professionalism and commitment of these partners to make a sustainable difference in the lives of children. The work they are doing is both humbling and inspiring, and I cannot wait to see their projects in action over the next 10 days. The first day of the forum involved an overview presentation by each partner, and the second day involved an update from CFTC on the organizational transformation we are undergoing from charity to change agent, along with a brief on our Roadmap to Change work as we move to a longer-term focus. Mulu Haile, Executive Director of MCDP (left) and Tessema Bekele, Executive Director of EDA enjoy dinner. It was a great two days – and Francoise, CFTC’s Ethiopian Program Manager, Gebriel Galatais, CFTC’s Ethiopian Country Representative and I received great feedback on how CFTC can continue to deepen our work from our partners’ perspective. Tomorrow, we begin partner project visits, with the first visit to Mission for Community Development Program (MCDP), hosted by Executive Director Mulu Haile and her team.